In an interview with the Osservatore Romano, the Prefect of Propaganda Fide expresses closeness to the underground communities, reaffirming the urgency of reconciliation and evangelization of Chinese society. Card. Filoni states that belonging to the Patriotic Association is not obligatory even according to Chinese law. Proclamation is curbed by "lack of real freedom" and "temptations of comfort" in China. Vatican City (AsiaNews) – While understanding and even at times sharing the perplexity expressed by many over the difficulties that still remain, the provisional China-Holy See agreement, signed last September 22, is of “historical significance for the Church in China”, states Card. Fernando Filoni, Prefect of the Congregation for the Evangelization of Peoples, in a long interview with the Osservatore Romano, published yesterday and reproduced in full below. The Prefect of Propaganda Fide defends the agreement that will allow the Church in China to keep up with the "supersonic" times with which the Middle Empire moves, offering "spiritual and human values ​​that give solid hope to people's lives and true cohesion to society ". At the same time he often repeats that he understands "the doubts" expressed on the agreement by the members of the underground community who feel "abandoned" and "almost betrayed". "I understand the perplexities; sometimes I share them ", says Card. Filoni, but "only with a superficial spirit or in bad faith could one imagine that Pope Francis and the Holy See would abandon the flock of Christ". The Cardinal, often citing the papal message to the Chinese and universal Church, published on the occasion of the agreement, pushes the two communities, official and underground, to reconciliation and evangelization of the country. With two very important underlining: at a certain point, in front of the underground community’s fear of "disappearing", Card. Filoni states that "The underground status will fade away, but not the people involved. Their faith, their traditions, and their spirituality remain, which are enjoyed by the entire Diocesan community". A second point is when he states that membership in the Patriotic Association (AP) is not mandatory: " I hope, therefore, not to hear or read about local situations in which the Agreement is exploited to compel people to do what is not even required by Chinese law, such as joining the Patriotic Association.". In reality, since the signing of the agreement, members of the United Front and the PA force and indoctrinate bishops, priests and underground faithful to join the PA, "because the Pope is with us". Cardinal Fernando Filoni, Prefect of the Congregation for the Evangelization of Peoples, has followed the delicate and complex journey of the Catholic Church in China since 1992, the year of his arrival in Hong Kong. In those years a diplomatic thaw began between the People’s Republic of China and the Holy See, when initial contacts were made between representatives of the Secretariat of State and the Ministry of Foreign Affairs in Beijing. 1) Q. – Your Eminence, for several years now you have led the Dicastery of the Holy See responsible for evangelization, with particular reference to the so-called “mission” territories. What do you see as the pastoral significance of the “Provisional Agreement on the Appointment of Bishops” signed by the Holy See and the Chinese Government on 22 September 2018? A.– Since the Dicastery that I oversee has a particular responsibility for accompanying the Church in China, I feel particularly called upon to speak about the pastoral significance of the Provisional Agreement. But I think Pope Francis said it best when, in his Message to the Catholics of China last September, he wrote: “the Provisional Agreement […] is the result of a lengthy and complex institutional dialogue between the Holy See and the Chinese authorities initiated by Saint John Paul II and continued by Pope Benedict XVI. Through this process, the Holy See has desired – and continues to desire – only to attain the Church’s specific spiritual and pastoral aims, namely, to support and advance the preaching of the Gospel, and to reestablish and preserve the full and visible unity of the Catholic community in China” (2). Furthermore, “The Provisional Agreement signed with the Chinese authorities, while limited to certain aspects of the Church’s life and necessarily capable of improvement, can contribute – for its part – to writing this new chapter of the Catholic Church in China. For the first time, the Agreement sets out stable elements of cooperation between the state authorities and the Apostolic See, in the hope of providing the Catholic community with good shepherds” (5). Ultimately, while sharing some of the concerns expressed by many parties because of the difficulties that still remain and of those that may arise on the journey, I feel that within the Catholic Church in China there is a great expectation of reconciliation, unity, and renewal for a more decisive revival of the work of evangelization. We cannot stay still in a world that, from many perspectives, is running at a supersonic pace, yet, at the same time, experiences the urgent need to rediscover the spiritual and human values that give firm hope to people’s lives and create a more cohesive society. In a word, this is what Christianity can offer to present-day China. I should add that in receiving much correspondence from Chinese clergy, as well meeting bishops, priests, religious women, and the laity, I have always observed their desire that the Church in China might return to a sense of “normality” within the Catholic Church. 2) Q. Your Eminence, you quoted the “Message of Pope Francis to the Catholics of China and to the Universal Church” of 26 September 2018. What differences or similarities are there between this Message and the “Letter of Pope Benedict XVI to the Catholics of China” of 27 May 2007? And what has changed in the meantime? A. - Well, in the Letter of Pope Benedict XVI, which you appropriately mentioned, in addition to many other valuable teachings, two essential things are affirmed. The first is that the underground situation is justified in so far as the protection of life and the defense of the faith in adverse circumstances require it; for example, when attempts are made to impose ideologies that are not reconcilable with conscience and Catholic doctrine. The second is that in difficult and complex situations, decisions and choices can only be made to the extent that they do not diminish the capacity for pastoral discernment, which is the responsibility of the Bishop in view of the greater good of the diocesan community. In the Letter of Benedict XVI there is already the insight that history proceeds and evolves, and that, within the changing historical contexts in which individuals and groups interact amongst themselves, the organization of thought, the elaboration of concepts, and the interpretation of social formulations, which are at the basis of our life, also develop. Perhaps what the Message of Pope Francis adds to this still valid teaching of Benedict XVI is the attention to the healing of memory in order to move on. This is a view decisively directed to the future in order to inspire a pastoral vision for the Church in China. Obviously, none of this can be realized without the heartfelt unity of the Bishops and the full involvement of Chinese Catholics on the one hand, and the trust of the civil Authorities on the other, which is also carried out in dialogue with the Apostolic See. In order to arrive at this, “precisely for the sake of supporting and promoting the preaching of the Gospel in China and reestablishing full and visible unity in the Church, it was essential, before all else, to deal with the issue of the appointment of bishops” (3). Many things can be said about the Provisional Agreement on the Appointment of Bishops signed last September, but one cannot deny its historical significance for the Church in China. In light of the Agreement that recognizes the specific role of the Pope, the so-called “principle of independence” now needs to be reinterpreted in view of the relationship between the legitimate pastoral autonomy of the Church in China and the indispensable communion with the Successor of Peter. I hope, therefore, not to hear or read about local situations in which the Agreement is exploited to compel people to do what is not even required by Chinese law, such as joining the Patriotic Association. In fact, the Church says no to a “patriotism” that would signify egoism, close-mindedness or control, and says yes to a “love of country” meaning respect for one’s roots, knowledge of the culture, protection of the common good, and the faithfulness of institutions towards its own citizens. We are working concretely and respectfully with the Chinese Authorities, and we are hopeful about what will take place from this point on and the good that may develop… with God’s help and the contribution of everyone. 3) Q. – Your Eminence, someone wrote that entrusting the Dioceses to previously excommunicated official Bishops will deprive the so-called underground communities in China of their Shepherds and force them to submit and adapt themselves to ideas, rules, and impositions that they cannot accept in conscience. Whereas others say that the fate of underground Catholics will be that they are absorbed into the official Community and disappear. What do you think about this? A. – In Chinese culture, there is a love of employing images. I will try to offer a descriptive one, as I see it. The Church was born in China from a unique evangelization; a source of fresh water flowed and clearly left its mark. Then, because of historic events, it was as if a large boulder fell from a mountain and stopped the flow of water; one part of the water flowed underground, while the other part continued to twist and turn on the surface. In these past twenty-five to thirty years, we have begun to speak of a journey that could help us rediscover the unity of the two currents. Work has been done, prayers have been offered and there have been many initiatives and gestures that have contributed up to now, with various ups and downs, to promoting this unity. It was not easy and it is still not easy. The years of conflict and misunderstandings cannot be ignored. There is above-all the need to rebuild trust, perhaps the most difficult aspect, toward ecclesiastical and civil authorities entrusted with religious matters, as well as between the socalled official and unofficial Ecclesial currents. It is not about establishing who wins or who loses, who is right or wrong. In the sixty years since the creation of the Patriotic Association, everyone, in perhaps an unequal and dramatic way, has suffered, both in a physical and moral sense. Nor can we ignore the interior anguish of those who had adhered to or had been bound by the principle of “independence” and therefore brought about a rupturing of relations with the Apostolic See. How many times, when I was in Hong Kong, did I listen to clergy who spoke to me about their sufferings. It was in order to deal with such situations that John Paul II, after careful consideration, welcomed the cries of those who were seeking mercy and asking for their canonical recognition as Bishops in the Catholic Church. The Holy See’s position was different with regard to priests, towards whom the principle that the People of God have a right to the Sacraments prevailed. There was no talk of the “illegitimacy” of priests, but it was always recommended that ordinations be carried out by legitimate or legitimized Bishops. I realize that someone could think that, in this phase, the Apostolic See seems to be asking for a unilateral sacrifice, that is, only from the members of the underground community, who should, one might say, be “made official”, while nothing is requested of the “official” members. The issue should not be put in these terms; in fact, it is not about the “underground” surrendering to the “official” or to the civil authorities, regardless of the appearance, nor of a victory over the non-official community. From a more ecclesial perspective, we cannot speak about competition or who is right, but of brothers and sisters in the faith, who all find themselves in a common House. What the Holy See has strived to do for thirty years has been to foster reconciliation between the two communities by rediscovering and reinvigorating their properly Christian and Catholic identity through a common journey toward a greater realization of what it means to be Christ’s Church in China today. In the Holy See’s view, it has always been held that in China there are not two Churches, a “patriotic Church” and a “faithful Church” (as used in common parlance). In China the Church is one, and the wounds that were inflicted upon her come both from within and without. The sensus fidei of the People of God has saved the Church in China from schism. In the current context, we can say that efforts have been made to alleviate the sufferings. It is a challenging task and will require everyone’s contribution to achieve it fully. I continue to be struck by some of the recent expressions of Bishop Wei Jingyi (a Bishop not recognized by the civil authorities until now). 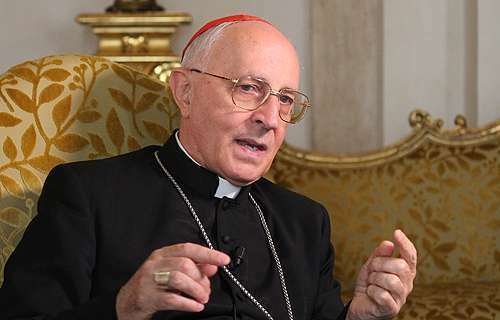 He said in an interview: “We must use concrete actions to heal the wounds that have for many years injured and divided the Mystical Body of Christ, which is the Church”. He then added, “No one is lost or abandoned on the Church’s journey. We all walk, hand in hand, with Mary. […] We also see that the many sufferings along the way have not been in vain”. This journey will require some concessions and sacrifices from everyone, as well as the adoption of new and concrete responsibilities, as Pope Francis requests of all Christians without distinction. There is now the need for gestures of reconciliation and of communion in truth and trusting that the Holy Spirit accompanies the Church and does not abandon her. 4) Q. – May we return to the initial question? A. – Yes, since it is of the utmost importance to provide an answer. That is, what would be the fate of the so-called “underground” community? This is a question that is particularly close to the heart of the Holy See. I would like to be clear: first, there are only two Dioceses that have seen changes in their leadership thus far (Mindong and Shantou). The aim needs to be unity, which I hope is not only a formal unity, but also a real unity, yet without being forced. The underground status will fade away, but not the people involved. Their faith, their traditions, and their spirituality remain, which are enjoyed by the entire Diocesan community. The same Bishops will wisely take care of and be responsible for such a ‘soul’. They will do this as diocesan Bishops of the entire people of God, without giving preference to one or another community base d upon its origin. I understand that in the Diocese of Mindong they are working for unity. I hope that the local civil authorities will understand the need to act gradually, without forcing the matter. As the aforementioned Bishop Wei Jingyi wisely states, all (both the civil and ecclesiastical authorities, inside and outside of China) “need to be psychologically prepared […] and walk step by step towards reconciliation with joy and gratitude. This is what our faith asks us to do”. It is necessary to have a spirit of welcome, moderation, ecclesial inclusivity, and forgiveness in order not to lose the authentic and transcendent dimension of the life of the Church. This primarily involves the Bishops since, as Pope Francis stated, “We are in great need of Pastors who embrace life with the vastness of God’s heart, who do not yield to earthly satisfactions, […]; Pastors who are heralds of the Almighty, free from the temptation of staying “under the radar”, free from the restrictive measures of a lukewarm and habitual life; Pastors who are poor, not attached to money and luxury; in the midst of poor, suffering people, and consistent proclaimers of Paschal hope” (Address of His Holiness Pope Francis to the Synod Assembly of the Greek-Melkite Catholic Church, 12 February 2018). I repeat that we must not see this phase in terms of winners and losers. It would be mistaken and misleading! Look, putting things into perspective, without deceiving myself that this will happen in an automatic or easy way, nor ignoring the difficulties that will always be there, I see, it seems to me, a Church more united, more aware, more prepared, and more attentive to the world that she is called to serve by witnessing to the Gospel. I would also like to see a Church more in harmony with the times in which she lives, as well as freer and in a Country that wisely continues to update itself. In his Message, Pope Francis also spoke of the prophetic and constructive contribution, drawn from God’s plan for human life, that Chinese Catholics must know how to offer: “this may also require of them the effort to offer a word of criticism, not out of sterile opposition, but for the sake of building a society that is more just, humane and respectful of the dignity of each person” (6). 5) Q. – Your Eminence, in China there are Catholics that, after having suffered greatly by remaining faithful to the Supreme Pontiff, now feel confused and, above all, experience the bitter sensation of having been practically betrayed and abandoned by the Holy See. What would you like to say to them? A. - To the Catholics who have witnessed to the faith, first of all, I would like to call to mind the consolation of Jesus who says: “Well done, my good and faithful servant […] enter into your master’s joy” (Mt 25:23); this consolation is invaluable, it has no price! It is the most beautiful consolation that one can hear the Master say. In any case, on behalf of both the Holy See and myself personally, I would like to express sentiments of heartfelt thanks and admiration for your faithfulness and perseverance in trial and for your trust in Divine Providence even in the midst of difficulties and adversities. Many, over the course of these years, have been true martyrs or confessors of the faith! Only with a superficial spirit or in bad faith could one imagine that Pope Francis and the Holy See would abandon the flock of Christ, wherever or in whatever condition it finds itself in the world. Therefore, we must continue to work to improve the perception of the faithful, who are often influenced by media messages that are not altogether correct or balanced and find it difficult to understand the due discretion that surrounded the dialogue between the Holy See and the People’s Republic of China. Greater respect is needed toward these brothers and sisters; nobody should take advantage of their situation. Nevertheless, I understand the doubts, I understand the perplexity, and at times, I even share them. However, I do not share the attitude of those who, while having their legitimate reservations, not only do not strive to understand others’ views, but most importantly run the risk of rowing out of sync within the ship of Peter. The Pope, together with his coworkers, has done, is doing, and will do all that is possible to be close to the Church in China. Our methods are not infallible, but we truly love the Church and the Chinese people. Work has been ongoing for many years and all of the circumstances are being studied. How many prayers have been offered in order to provide comfort with spiritual tenderness, to illuminate with the word of God, to encourage by means of stable guidance, and also to find solutions on the diplomatic level! I invite all possible collaborators to bring these sentiments and words to those who need them and feel abandoned. For the rest, what the Psalmist proclaimed will always remain true: “He who sows in tears will reap in joy” (Ps 126:5). 6) Q. – Your Eminence, what are the plans for the Catholic Church in China? As you see it, what is the future of Christianity in that Country? A. –I would distinguish between two aspects. About the first, the plan for the Church in China, I would say that she must seek to be even more aligned with the essence of the Church, always growing in the direction of faith, hope and charity, constantly working for the youth, new vocations, ecumenism and interreligious dialogue, the formation of clergy and remaining attentive to the needs of those who remain on the margins and are in need of growth. Additionally , she must work to discover and give shape to “how” this is done, adapting her means and methods, which is especially incumbent upon all Chinese Catholics. Even if the Church in China is still onlya small flock, the way forward is one of faithfulness which accompanies the sower who sows the good seed in the field: “Fear not, little flock, for it is your Father’s good pleasure to give you the kingdom” (Lk 12:32). The plan, therefore, is that which Jesus entrusts to the apostles: “Let your light so shine before men, that they may see your good works and give glory to your Father in heaven” (Mt 5:16). In all this, then, a more profound view of the Documents of the Second Vatican Council and the Papal Magisterium that applied it and enriched it until the present day would certainly help. Regarding the second aspect, that is the future of Christianity in China, even though one may be pessimistic, I would say that the history of the Church in China speaks for itself. Here I would call to mind Xu Guangqi (Mandarin, appointed Minister of Rites of the Imperial Court at the time of Matteo Ricci), who described the richness of Gospel values and their divine origin to the emperor, who questioned him about becoming Christian. A faith that proclaims the forgiveness of one’s enemies must have this divine origin. I am, therefore, realistically confident in the proclamation of the Gospel. I hold that only the lack of a true freedom and the temptation of comfort can suffocate a good part of that seed sown many centuries ago. In any case, the present situation charges us with the responsibility of proclaiming the Gospel and overcoming the temptations of our difficult times. 7) Q. – Your Eminence, are there any particular wishes that you would like to extend, in this context, to the Catholics living in China and to the Chinese Catholics, who for various reasons of work or life circumstances are spread throughout the world. A. – Yes. It is the Lord who guides history. Therefore, I would hope that, first of all, in dealing with any possible dilemmas, they would know always how to see the other with trust, even if some aspects of the current situation are perceived as injustices and with difficulty. I repeat, none should see an enemy in a reconciled brother, but rather a brother in whom to rejoice. The Lord has overwhelmed us with his forgiveness. As we know, the Chinese like images. To complete my thought, I would like to give them yet another one: In order to give stability to a tripod, three supports are needed. A tripod, in fact, does not rest upon two legs, that is, on the arrangement between the Holy See and the Chinese government. There needs to be a third support, namely the participation and the contribution of the faithful in China, as well as that of the Catholic community in the diaspora. Only with the contribution of all can the Church of tomorrow be built up, while respecting freedoms, also on the part of the civil Authorities, after sixty years of suffering, division, and misunderstandings within the Catholic community. The Church, therefore, needs the free and fruitful participation of all in order to construct civil, social, and religious harmony, as well as for the proclamation of the Gospel. God needs the Catholic Community in China! “Never let us allow this opportunity to be taken from us”, as Pope Francis might say in one of his happy expressions from Evangelii Gaudium.